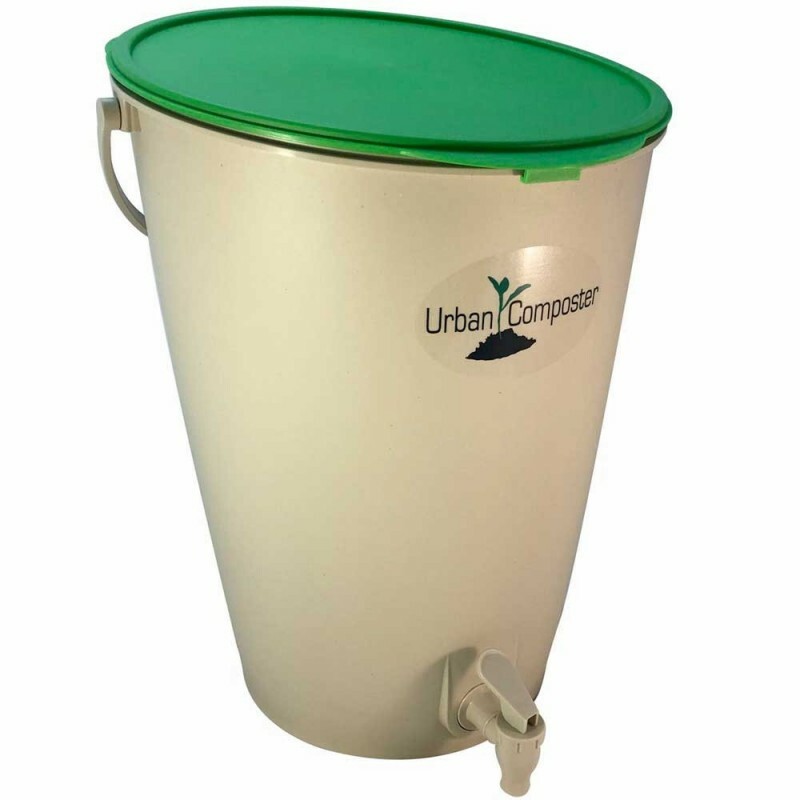 Urban Composter is a stylish Australian designed and made Bokashi bucket that maximises capacity and uses a convenient fermenting spray. Made from recycled plastic with an improved easy-clip lid and internal tap design! This is for the bin only - see here for the Compost accelerator or a complete kit. Comes with a green lid. Buying this product = 59 Reward points for Members. Your cart will total 59 points = voucher of $2.95. Not a Member? Join at checkout to claim these points. Urban Composter is on Advance Order. All orders will ship after 29th April 2019. The new Urban Composter bokashi bucket has some clever attributes to help you compost more. Choose your lid colour. Completely air tight so no smells or flies and looks great in any kitchen. All types of food scraps can be added including greens, meat, fish, citrus, dairy, coffee grounds, wilted flowers, egg shells and more. Turns organic scraps and leftovers into nutrient-rich fertilizer right on your bench top, with no bad smells! The Urban Composter is an anaerobic composting system that uses microorganisms to ferment food scraps so they can quickly break down when buried into soil. The result is a rich & nutritious soil conditioner. The Urban Composter system applies the Bokashi micro-organism from a spray bottle, so there is no need to cart around and store the sawdust/grain option that is used as a carrier for the micro-organism. That said, you can use either form of Bokashi powder or spray bottle with either system. Compost accelerator needs to be purchased separately for $9.95. Return your food scraps to the earth to enrich the soil, reduce waste and reduce carbon emissions. Cut up your food scraps and throw them into the Urban Composter bucket. Spray Compost Accelerator onto the scraps every time they are added (recommend 4-5 sprays evenly over scraps). Bokashi grain mix can also be used if desired. Push scraps down to compact the layers each time and ensure lid is sealed. In just a few days you can drain off the soil conditioner from the tap. When the bucket is full, simply drain all the remaining liquid, dilute it and add to plants. Dig the remaining pulp into some soil and leave it to settle for 6-8 weeks. The treated soil is ready to spread on the garden, top dress your lawn or add to your plant pots for some great results. When emptied clean only with Citrus Natural Cleaner spray as this won't harm microbes inside composter, or fresh water. 29cm diameter, 40cm high at back, 35cm high at front. Approx 16L capacity. Compost accelerator available to purchase separately. Small family-owned Australian company. Australian made. please note that shipments of theUrban Composter to all areas of WA, NT & TAS and some areas of regional SA, VIC, NSW & QLD will incur an additional freight charge. If applicable, we will check this with you before despatch. I love my Urban Composter. I keep it under the sink and it lasts for about a month before it is full, at which stage I switch to using my regular compost bin while this ferments for two weeks. There is a smell to the Bokashi spray, though it goes away once the lid is closed.